I want to make a slideshow for our wedding and have a bunch of different songs that change according to what year the pictures are that are being displayed. (I only want like 20 or 30 seconds of each song played). Does anyone know of a program I could use to add songs and pictures and be able to edit the songs to only play certain parts? Have you ever got into such kind of trouble as described above? Wedding Slideshow Studio comes to rescue! 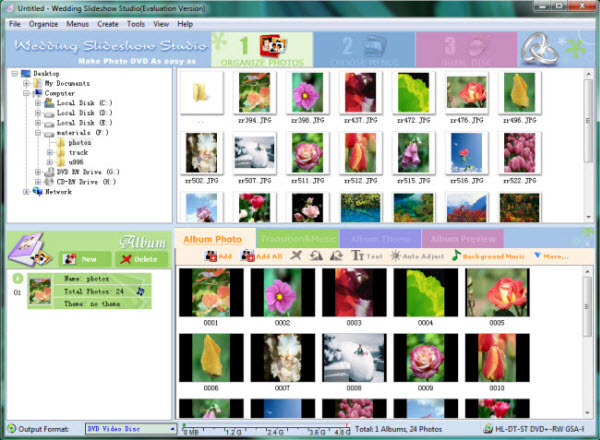 This Wedding Slideshow Software can help you convert wedding photos to .3gp, .3g2 or .mp4 video slideshow and create wedding photo slideshow video so that you can watch it on 3G mobile phones and other cell phones such as BlackBerry, Samsung, LG, HTC, Sony Ericsson, Motorola, Nokia, Gphone, etc. The steps are as easy as 1, 2, 3. After making all necessary settings above, choose "Create -> Create Mobile Phone Playable Movie". You can also click the "Burn Disc" tab on the interface of Wedding Slideshow Studio and choose "Create Mobile Phone Playable Movie" from the "Output Format" list. 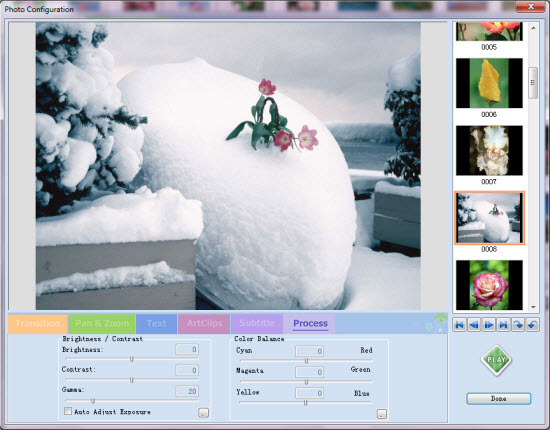 In the "Parameter Settings" panel, you can specify output directory, profile (3GP, 3G2, MP4), and video/audio parameters such as video bitrate, size, codec, frame rate and audio codec, bitrate, sample rate, channel. Click the "Create Now!" button to starting creating slideshow video for Cell Phone. After the whole conversion process, you can get the output .3gp, .3g2 or .mp4 slideshow video file in the default output directory or the one you specified. Then you can feel free to transfer the slideshow to your mobile phone and enjoy it.